All three major amusement parks (Walt Disney World, SeaWorld and Universal Orlando) provide assistance passes for people with disabilities. You can obtain them at Guest Relations as you enter the park. However, the passes are different at each park, in both appearance and how they can be used. 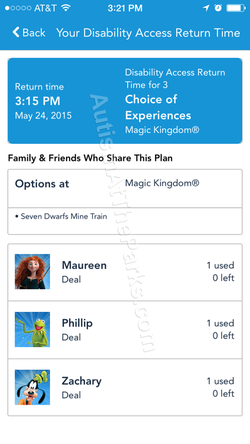 Below is a summary of the assistance passes for Walt Disney World. Tip: If your special needs child must remain in his/her stroller during the queue, make sure you ask for the "use stroller as wheelchair" tag accommodation. THE GUEST ASSISTANCE CARD (GAC) WAS REPLACED ON OCTOBER 9, 2013. IT IS A DISABILITY ACCESS SERVICE CARD (DAS). DISNEY CHANGED THE DAS FROM A PAPER CARD TO AN ELECTRONIC SYSTEM ON APRIL 30, 2015. Purpose of the DAS: The DAS is designed to reduce the amount of time the guest is required to stand in a regular queue for an attraction, for those guests who have difficulty waiting in the regular queue for reasons other than mobility. It is not designed to reduce the total amount of time the guest waits for a ride either outside the queue or while the guest is in the fastpass queue. The guest is expected to wait in an alternate setting of the guest's choosing until it is time to return to the attraction and enter the appropriate queue. Our recommended steps to requesting the DAS in Walt disney World. The steps below are based on our experience and some are recommendations only. They are not all necessarily required by Walt Disney World. c. Family member needs to use their stroller as a wheelchair. e. Any other unique characteristic that you feel should be taken into consideration that would restrict your family member from experiencing the attractions. 2. Requirement: The person who needs the DAS and all persons who will be accompanying them on the attractions must be present when you are at Guest Relations, along with their Magic Band (or park ticket if they do not have a Magic Band). 3. After you have entered the park, Go to Guest Relations and explain to the Cast Member (CM) that your family member needs accommodation. Explain accommodations needed as you outlined in #1 above. Using "labels" (e.g. my child has autism) is not as effective as describing your family member's needs (e.g. my child can not wait for for long periods of time in a queue or they will start to display inappropriate behaviors and may get very upset). 4. After the cast member approves the need for the DAS and explains how the DAS works, the family member who needs the pass (or a guardian) will have their photo taken. This is done quickly by the CM using a tablet (like an iPad). Information may also be taken from a photo ID and entered into Disney’s computer system to help code the DAS (Some guests report that they were not required to present an ID while others have been asked for one). We were asked for an ID and presented our son’s ID, but you can use a guardian’s ID. 5. The CM will then assign the DAS to the guest's Magic Band (or park ticket if they do not have a Magic Band). The CM will also scan the Magic Bands (or park tickets) of each of the guests accompanying the DAS user. The photo of the DAS user and the names of each accompanying guest will loaded onto the DAS system. The DAS active is for 60 days or for the length of your visit to Disney, whichever is shorter. 6. Thank the CM for their assistance. The DAS can be used for access to rides and attractions at Walt Disney World's four theme parks, Magic Kingdom, Epcot, Hollywood Studios and Animal Kingdom. It can not be used at the water parks. The DAS can also be used for character meet and greets and shows that have Fastpass+ access. 1. At least one member of your group must go to the attraction you wish for a DAS return time. The DAS holder does not have to be present to obtain an attraction's return time. Any member of the group can use their Magic Band (or park ticket) to obtain an attraction return time. Greet the CM at the entrance to the attraction and explain that you need a DAS return time. 2. If the posted wait time for the standby line is 10 minutes or less, you will be directed to enter through the Fastpass+ or alternate entrance of the attraction immediately. 3. If the posted wait time for the standby line is more than 10 minutes, the CM will scan your Magic Band (or park ticket), ask how many/which members of your group will be riding and then assign a return time as calculated by the system. Return times are usually the posted wait time minus 10 minutes. For example: You arrive at Splash Mountain at 11:00 and the posted wait time is 45 minutes. Your DAS return time will be 11:35. 4. Return times do not expire or do not interfere with your Fastpass+ reservation times. You can view your DAS return time if you are logged into the My Disney Experience app (MDE). If you do not have access to the MDE app, we recommend that you write down your return time. 5. You cannot obtain another attraction’s return time on the DAS until it has been used or has been deleted out of the system by a CM. 6. Make sure you have a plan during your wait time. Eat a snack, watch a show, shop, look for hidden Mickeys, ride another ride with a short wait time or use a FP+ reservation (see more tips below). 7. When your return time arrives, proceed to the FP+ or alternate entrance of the attraction. VERY IMPORTANT: THE DAS HOLDER MUST SCAN THEIR MAGIC BAND (OR PARK TICKET) FIRST. After the Magic Band is scanned, the CM will verify the return time and match the guest photo that appears on the CM's computer screen to the DAS Holder. NOTE: Unlike FP+ reservations, DAS return times expire only when the park closes for that day. You can use the DAS at the reserved attraction any time after the return time indicated. 9. After you have experienced this attraction, you can obtain a new return time for your next attraction, including the one you just experienced if desired. You can view your DAS return time if you are logged into the MDE app. What if your family/group has more than one member who requires the DAS? Some CMs at guest relations say that a family must split up and half of the group be assigned to one DAS holder and the other half of the group be assigned to the second DAS holder. This is not a requirement. If your family needs to have two separate DAS without splitting up the family, you can request to speak to a supervisor and insist that you have all the non-DAS holder members of your family be assigned to both DAS. Please remember, no one can have more than one active DAS return time. Each member of the group who requires the DAS will be coded appropriately in the system as outlined above. Each member of the group who will be accompanying the DAS holders will also be assigned to each DAS. However, when obtaining a return time, each accompanying member will only be allowed to have one assigned return time. For example, if DAS holder A gets a return time for attraction A, and DAS holder B obtains a return time for attraction B, guest C can only be assigned to either attraction A or attraction B. They are not able to be assigned to more than one DAS time simultaneously. If you have tried the DAS and FP+ together and they are not enough accommodation for your family member, we recommend that you return to Guest Relations and explain that they will require more accommodations. Guest Relations can provide additional help including but not limited to additional non-expiring Fastpass+ reservations, Re-Entry passes and they can also assign your first DAS return time of the day if needed. Guest Relations is more receptive to providing these additional accommodations if you can explain why they are needed. What if the electronic system is not working? If the electronic DAS system is not working, due to glitches, WIFI issues, etc., then the CM at the attraction will either provide a paper pass in lieu of the electronic assignment that will act just like the electronic DAS or may allow you to immediately enter the attraction through the FP+ queue. It is up to the discretion of the CM. ​Recommendations and tips for each Walt Disney World park. - Whether vacationing for a week or as an annual passholder, plan your visit during low crowds levels at the parks and the off season in order to create a more positive vacation experience at Walt Disney World. - Be prepared. Decide what your priorities are before you head to the park. i.e. We must ride Space Mountain but Peter Pan will be okay to miss. - Have a plan and an alternate plan and maybe a third plan regarding what you will do during the wait times to entertain, distract or engage your family member that needs the DAS. Waiting in between attractions is one of our son's biggest challenges and it takes both parents to effectively coordinate distractions on a slow day at the park. Some things we do is experience an attraction that has a short wait time, like Country Bear Jamboree, Mickey's Philharmagic or The People Mover in the Magic Kingdom. You can also visit Tom Sawyer Island if you need to be away from crowds during your wait time. - If possible, have one member of your group as a "runner" to obtain the DAS return times so your family member will not have to arrive at an attraction only to leave it without riding; especially if they are unable to understand they will have to return later in order to ride. - During crowded times at the parks, there will be long waits (sometimes 90-120 minutes) for your family member between obtaining a DAS return time and actually riding the attraction. a. Try to utilize the Fastpass+ system in conjunction with the DAS as much as possible. 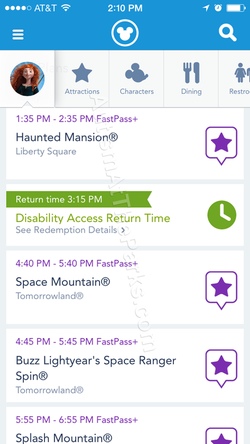 Reserve the attractions with the typically longest wait time with Fastpass+ and use the DAS for riding those attractions a second time, for other attractions with typical shorter wait times, or for attractions located near those you have a FP+ reservation. Here's a link to our blog Coordinating the DAS and FP+ at Walt Disney World. b. Try to see street shows and ride attractions with shorter wait times while waiting for your DAS return time. c. Plan DAS attractions around meals/snacks and eat during the wait time. d. Depending on your family member’s abilities, look for hidden Mickeys throughout the park or have your family member practice social skills and pin trade with CMs. e. At the Magic Kingdom sign up for Sorcerer’s of the Magic Kingdom or A Pirates Adventure quests and do the tasks during wait times. At Epcot, sign up for Phineas and Ferb and do the tasks during wait times. At Animal Kingdom, sign up for Wilderness Explorers and do the tasks during wait times. - As we always recommend, please be patient with all cast members if any glitches with the DAS and/or FP+ system occur during your vacation. There is no Fastpass+ or DAS for the water parks regarding waiting in line. We suggest you go when it is not the peak summer season or either very early in the day or later in the afternoon to avoid the more crowded times. The wait time can be as long as one or two hours or more on some of the more popular attractions. It can become challenging for our son on crowded days when the wait time exceeds 15-20 minutes.